After a few quiet months things have been a lot more productive for my Skaven over the last few weeks. For those who’re new to this project, I’ve been collecting Skaven for a number of years (since the release of the most recent army book for Warhammer in fact, which was quite some time ago now). However the actual painting was proceeding at a snails pace – something only exacerbated when I purchased a friend’s collection and the pile of unpainted plastic grew overnight into a mountain. In order to remedy this situation I’ve challenged myself to paint something new for my Skaven army every month in 2017 – even if only a single clanrat. Truth be told some months I’ve come pretty close to achieving only that minor goal but, I’m pleased to announce, this month wasn’t one of them. This brings the current clanrat total up to sixty – which means it’s high time for a celebratory group shot. 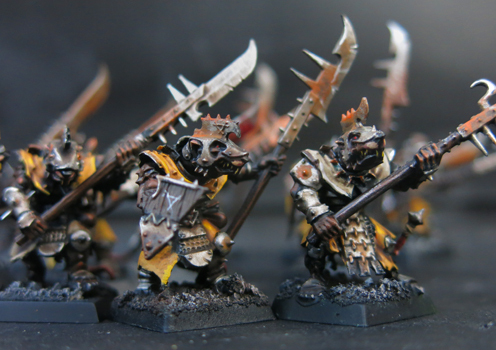 That’s not all however, this month I also managed to reinforce my stormvermin squad with four more of the rat elite. Now much as I like the models I’m not sure I find stormvermin that much fun to paint – they’re jagged, vicious little things that fought back almost constantly, jabbing me painfully in the fingers with their various spikes every time I tried to handle them. That said I’m already planning a second squad, this time made up of the albino guards of the Council of Thirteen. Before that however this squad will need a command group to finish them off. I struggled to come up with another guardsman, I really did, but whatever creative wellspring had informed the previous four clearly ran dry at this point because nothing I produced seemed to work. It was all either too obvious or too damn obtuse and the more I struggled the more irked I became. Eventually, in an artistic temper tantrum, I swore off guardsmen altogether and turned my attention back to the original guidelines posted by the Iron Sleeters. An Imperial Agent then. Amongst the tens of thousands of mortal soldiers descending on the moons there would be those out with the Guard’s chain of command. Feared and respected by the common soldiers, they move amongst the ranks in pursuit of their own mysterious agendas. A new vein of creativity had been tapped! Cue delving into the deepest corners of the bits box, tearing unloved and unlovable models from the shelf of shame, breaking apart the unpainted and half-forgotten to create this, masked and unknowable woman. What brings her to the Moons? What cause does she serve? Who’s agenda does she act to further? What secrets lie hidden behind her mask? Does she serve our cause, or the enemy’s? Your appointed duty is to bear the mortal remains of Colonel Idris to the front. Let him see battle once more. Let him gaze upon the faces of the heretics and they shall know that against an Imperial martyr there can be no victory. There’s definitely a need for more work here, both on Colonel Idris himself and to remove the rictus grin from the soldier charged with bearing him into battle. Otherwise though I’m rather pleased with him (or should that be them). And yes, I know the brief was for five individuals and I’m sneaking in a sixth… Leave the poor Colonel alone though – it’s bad enough the chap’s dead without you trying to stop him enjoying the war! In 1974, John Watson, an anthropologist based at Harvard University, assessed twenty-three cultures to compare the behaviour of warriors who wore masks or disguised their appearance with war paint, with those who did not. He found that masks do more than conceal our identity, they dehumanise us, segregating us clearly from our victims. Sure enough the masked warriors were significantly more vicious than their unmasked peers, with an 80 percent increase in their likelihood to torture or mutilate their victims, or to kill those who were defenceless. Individual liability is stripped away and replaced with anonymity, a curtain behind which the most terrible acts of brutality can be conducted without the fear of social repercussions. Furthermore the mask dehumanises the aggressor in the eyes of their victim, inducing a sense of fear which only provokes more violence from the masked antagonist. The Imperium marches on fear far more than brotherhood. In the brutal wars of attrition used to hold the Empire of Man together at the close of the 41st Millennium there is little time to build up bonds with ones fellows before they are swept away by ruthless war. Far quicker and more expedient to drive the ranks forward not because they fight for a greater cause (although they know that the Emperor is with them, guarding their souls as they use their flesh to guard His realm) but because going back is more frightening than going forwards. Thus my sergeant wears a helm that separates him instantly from his men. Masked and faceless he is marked out as a killer to be feared, both by the enemy and those he leads. To those he commands in battle he is not a man, a complex and flawed creature like any other, but an avatar of authority. His voice is the voice of the Imperium, his will is the will of the High Lords and to the men gathered before him in some grubby trench on the fringes of the Thorn Moons he is as close to the Emperor as they will ever come. He cannot be appealed to or reasoned with for that unyielding mask is the face of the Imperium and in his hands lies power over mortal flesh and immortal soul alike. So when he commands that his men go forward what else would they dare to do? Nothing fancy this time, indeed this was probably the simplest conversion I’ve undertaken in a long time, but the bits just clicked and I know better than to over-egg a pudding when I feel it’s working. I mentioned yesterday that I had been inspired to join the Iron Sleet Invitational, to – as they put it – “study humanity in the eternal war”. Many of you will already be aware of the Invitational and the Thorn Moons crusade, but for those who are not the Thorn Moons event builds upon the Pilgrym event (and if that’s news to you then where have you been?!). The participants’ aim to take the inspirational world-building and miniatures of the Pilgrym event and apply it at an army sized level, something which I’m sure a great many of us (myself included) will be watching very closely indeed. Rather than try to describe my interpretation of someone else’s project however I urge you to take a look at the Iron Sleet website if you’re not already. Suffice to say that when the opportunity arose to contribute my own vision of the 41st Millennium to the event my response was a mixture of delight (naturally) and trepidation (after all I was about to place my work alongside that of some of the finest convertors and painters currently at large). Throwing wide the creative gates the Iron Sleet group have called on hobbyists everywhere to join in their enterprise. The brief – simply to portray the humble humans sent to fight in the Thorn Moons, the mere men in a universe so often dominated by monsters and supermen. “Build and paint five human sized models that beautifully and fittingly describe the humble human in the galactic war and show of your original ideas and understanding of the Warhammer 40000 universe. We shall be several weeks under warp before we approach the Thorn Moons. Our time is to be spent training, readying ourselves for the battle to come. None of us have seen combat before. Our training officers tell us that does not matter. After so many centuries of isolation the enemy will be weak. They have never faced the wrath of the Imperium – never been tempered by foes such as us. The first bombardment will shatter them. I shall not fail my Emperor. I’ve already discussed the philosophy behind my contribution in great depth so let’s launch straight in with the first couple of models. Neither of these is completely finished yet – and I’ll add that this probably applies to everything else I’m hoping to show over the next few days – but that further tweaks and adjustments will come once I’ve heard some impartial feedback (that’s your job by the way). Please excuse the fact that these models were all pre-owned (and pre-loved, if that doesn’t sound too Slaaneshi), the old, cracked primer predates my ownership. There’s still a little work to do on both of them before they’re ready for paint but the second model especially will need more greenstuff before he’s truly ready to go. His rebreather has also slipped a little (something I overlooked whilst taking the photos) and will need adjusting. In the 41st Millennium practicality is rarely a concern. What matters is appearance, the pomp required by those who serve the Emperor, and a rigorous adherence to tradition. When soldiers advance they do so to the beat of a drum. It stirs their hearts for battle and it makes up for the fact that there hasn’t been enough time to teach them how to march before launching them into combat. It is the stars that I shall remember, when I am old. We do not have them in our cave cities you see. The officers laugh at me when I speak of this, in a way that makes me wonder if they are being cruel. The other men tell me that to see the stars one must first gaze upon the sky and on our world only a few dare the surface and they see only glimpses of the hive-spires through the smog. To think that all this glory has been circling above our heads for all these centuries and we did not know. Every one of them, every point of light is a world belonging to the Emperor! I wonder which is Terra, which Cadia, which Macragge? I read of these worlds, I coveted every story that told of them, I dreamed of them as I laboured in our city beneath the ground. To think that now I shall see them all! I wonder if I shall meet the Emperor? Although the Imperial Guard has often appealed to me I’ve always found the miniatures themselves to be amongst the least inspiring in the Games Workshop cannon (sharing a space next to the Tau and the High Elves at the very bottom of the list of things I’ll probably never paint). The filth and insanity, the sheer alienness of humanity in the 41st Millennium, simply hasn’t rubbed off on them. This is something I’ve written about, at length, on many occasions, but it’s taken the second Iron Sleet Invitational to get me to do something about it. Ultimately it’s the humble guardsman who defines life in the 41st Millennium, who shows us what it is to be a human amongst the stars. It’s a well-trod complaint that Age of Sigmar lacks personality whilst the focus remains on the superhuman Stormcasts and not the mortals who actually live in the Mortal Realms (and yes, I’m aware that this is something GW have attempted to address although to my mind they still have a way to go there). Likewise the space marines may be supermen, and the horrors of the galaxy horrifying, but only when stood in comparison to a normal human, a person like you or I. Of course I’m a big fan of the Vostroyan Firstborn and the Armageddon Steel Legion – indeed I’d like to see all the existing guard regiments given plastic kits to replace the ageing metal models. They capture the range of diverse cultures within the Imperium. However what I want to see are the normal soldiers, the fighting men raised from worlds without particularly unusual climates or cultures. It’s like only having the Space Wolves without the Ultramarines, the weird is only weird when we have a baseline of normality to compare against. My mental image of the Imperial Guard has always mixed together elements of the Death Corps of Kreig, the Solar Auxilia and the Bretonian peasantry – all seen through the lens of the Regimental Standard. To me part of the problem with the Cadians is not that they’re normal people – I’m all in favour of that – but that they’re normal modern people. If you or I ended up in 41st Millennium and managed to stay alive long enough to be press-ganged into the Guard we’d probably look a lot like a Cadian. The thing is the everyday people of the 41st Millennium aren’t like us. They grow up with incredible hardship. They think one square meal a day is a luxury, they wouldn’t know what to do with a bath and medical treatment for minor injuries is out of the question. They’re all indoctrinated from birth into a state religion that calls for fanatical worship. They think nothing of having limbs or organs chopped off and replaced with mechanical odds and ends (assuming of course that they are considered worthy of this). Whilst we are raised to believe we’re individually special they are taught that they are disposable, mere cogs in a dystopian machine that has kept mankind alive against the odds for ten millennia. Very little of this is represented on the actual models however. Take a look at this picture and we see the classic image of the Imperial Guard at war. Thousands of soldiers pour forth, backed up by strange characters; priests, wizards and the cybernetic hybrids of the Mechanicum. Rather than blending the medieval with the futuristic the two have been rather lumped together so that the good old Cadians look like part of a completely different army to the specialists. …but only occasionally, such as with this commander, are there signs that the two originate from the same culture, let alone belong to the same army. We’re often presented with the idea that there is a level of progression from the PDF (planetary defence force) and the Guard – and that the Guard are better soldiers. To my mind this doesn’t quite add up however. Those in the PDF can be career soldiers, and actually gain some degree of exposure to combat hunting down local pirates, escaped convicts, minor cults and whatever else threatens the Emperor’s peace. In the Guard one is handed the best equipment that hasty mass-production can buy and thrown into the path of the nearest rampaging enemy. One’s experience of actual fighting probably lasts about 20 seconds and ends badly. The aim is not to outfight the enemy, that’s what the astartes are for, but simply to choke it with weight of numbers. Much like Khorne the Imperium cares not from where the blood flows, so long as in the end the enemy drowns in it. In those few words he sums up much of what I’m trying to convey in this rather long and wordy post. The Imperium is beset by a myriad of enemies, including those vastly technologically superior (the Eldar and Necrons for example) or with functionally limitless forces at their command (Orks, Tyranids, Daemons). All the Imperium really has on its side is sheer size and bullishness. People it has in abundance. The mathematics are harsh but honest – no matter how seriously an individual guardsman may be outgunned the Imperium can afford to keep throwing more and more into the breach. Best case scenario one of them get’s in a lucky shot. Worst case scenario eventually the enemies gets tired out killing them all and has to stop for a rest. My aim is to capture Guardsmen like these who appear to actually belong in the 41st Millennium, rather than being imported from our own. Imagine then the life of the poor Imperial functionary. Their orders are to raise a (probably quite unobtainable) number of soldiers in a ludicrously short span of time before the enemy finishes killing the last lot and turns their attention towards more important targets. No-one cares how good they actually are at fighting, and they’re unlikely to live long enough for anyone to find out. It’s not his job to inspect them, or worry about their health, their mental state, their equipment. They’re given a lasgun and told to do their best, and by the Emperor they damn well do it. The appeal of the Guard is not merely that they “are but men” but that they do their best even when the odds are stacked against them. Distinctly an inhabitant of the 41st Millennium (rather than just a modern soldier with an aquila on his gear). A character in his own right (after all these people had their own lives before recruitment and have their own personalities and character quirks, they’re not just members of a mass-spawned horde like a guant or a necron). We should care about them enough that their impending death is a tragedy as well as an inevitability. When it comes to my own vision of the Guard the Cadians remain a good place to start, but they’re still crying out for a few critical changes to give them the sense of grubby weirdness that otherwise encapsulates 40k. I’ve armed myself with five Cadians (rescued from induction into my traitor guard army – something which I might include in any background I end up writing for them) and started tacking together bits. Watch this space! All images used are copyright Games Workshop.